5 Year Itch – Our Label Re-design! After celebrating our five year anniversary this past fall, we thought it was time to go back to the drawing board and create a new label design to feature on all future vintages—not a simple task but a process we entered with enthusiasm! Blowing the dust off of some old verbiage we had from way back in 2006 and 2007, we created a new format for the back label to feature the name of the wine and a few descriptive lines unique to that wine and vintage year so our customers have some tasting notes or brief back history of the grape/fruit. We have our Riesling 2011 to thank for this project. We wanted to start fresh this new year with all the wines bottled from January on to have the new label, and Riesling ‘11 will be the first wine all dressed up in the new design (bottling tomorrow!) We also re-wrote new “mission statements” if you will, to highlight our goals as a winery and show our passion and dedication in crafting each bottle at Greendance. Here’s a good time to give some pointers about what the words on a wine label actually mean. Surprisingly some words and characteristics do not always mean what you may think. Wine label wording is a messy and complicated endeavor to stay within regulations and to make sure the right key words are used so the consumer is not deceived. Books are written on wine label analysis, but I promise to keep it brief here. The vintage, or year, stated on the label tells you when the grapes for the wine were picked. In order to state a vintage, 95% of the grapes in the bottle had to come from that stated year. There are often opinions about some years being better than others, but if you’re at Greendance, you won’t have to worry too much. Alcohol content is required to be on the label. Typically wines will stay in a certain range (about 12.5% – 15%) This can be mistaken as some measure of quality, false. Most dry European wines are between 12 percent and 13.5 percent alcohol, rarely higher. Sweet wines (such as German Rieslings) may have alcohol levels as low as 7 or 8 percent, because a lot of sugar is left unfermented. In America, higher alcohol levels have been trending upwards in the past few years. The back label can contain a wealth of information in just a select few words. The back label tells you a lot about the journey of the wine in the bottle—which winery actually made/produced the wine (it might not always be the winery name listed on the front! ), where it was made (on site at the winery versus some other location), who bottled it, and how much of the wine in the bottle was actually made at the winery. The very first thing you want to know is who made the wine. For domestic wine, turn to the back label on the bottle. If it says “Produced and Bottle by” it means that by law 75% or more of the wine in that bottle must be made by the producer listed. If the wine bottle says “Made and Bottled” it means at least 10% of the wine is made by the winery or company listed. If the bottle indicates “Vinted and Bottled” it means the winery on the label may have had little to do with the making of this wine—in fact the wine itself may have been purchased ready already ready, in which case the story of the grape to glass can be lost. “Estate Wine” can also be found on either front or back (usually the front for prominence) and means that 100% of the grapes used to make the wine were grown by the winery on their own property. 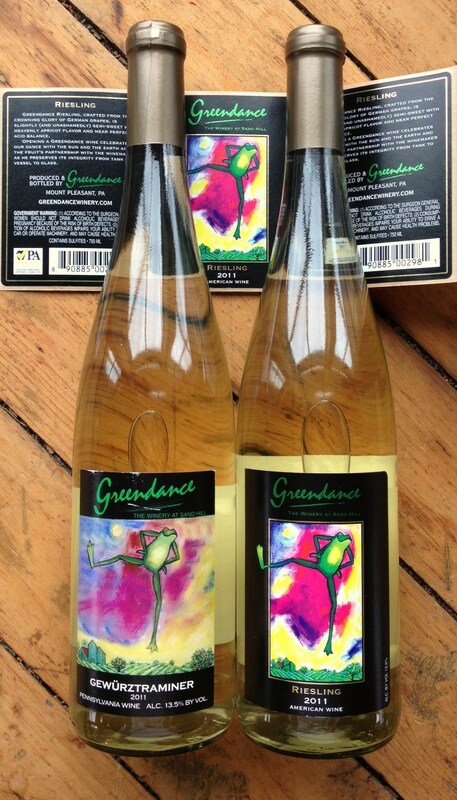 We have three estate wines here at Greendance – Frontenac, Frontenac Gris and Muscat.